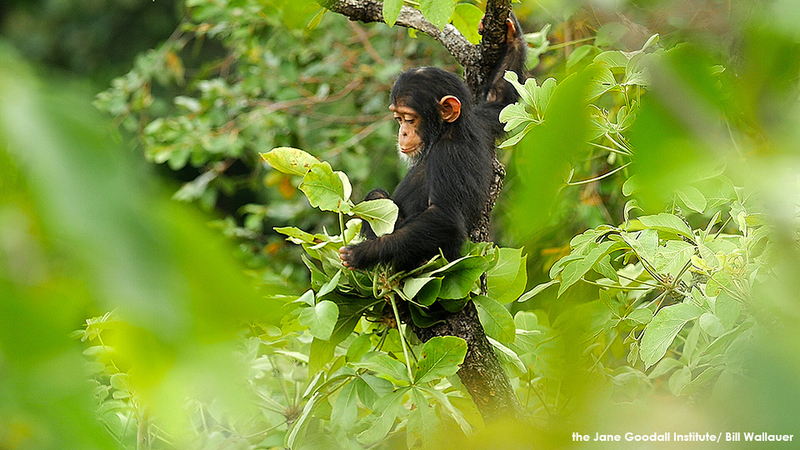 Even within the relatively secure borders of Gombe National Park, the safety of the chimps and other wildlife can be threatened by the presence of human activity and settlements near the park boundary. Encroachment for firewood, hunting, and mushrooms have been an problem in the past, but with the conservation and humanitarian efforts of JGI Tanzania, these issues have decreased in recent years. However, people still own dogs and pets and to protect their homes. These local dogs can form packs that can run together both outside and occasionally inside of the park. So what happens when these two worlds collide? Recently, two JGI field assistants were following a group of Mitumba chimps in Gombe, including Edgar and Lamba, not far from the northern border of the park. The group was eating in the canopy when they heard the barking of dogs in the distance. Chimpanzees are wary of strange sounds, and they probably are aware that dogs have been used by hunters in the past. Edgar and Lamba rushed to each other and embraced one another; for both reassurance and mutual support. The group climbed down and started traveling in the direction of the barks. En route, group members pant hooted and Edgar drummed on the ground. 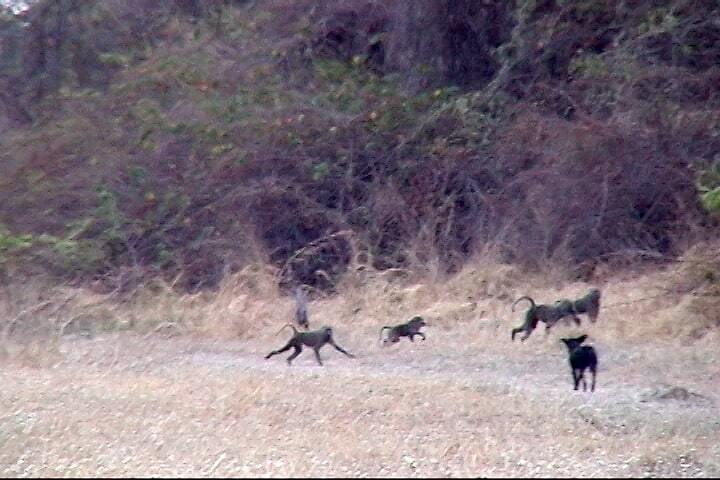 The field assistants observed the pack of dogs surrounding a tree filled with baboons. Clearly the dogs had attacked a baboon troop and were circling beneath the tree in an attempt to get to the baboons. As far as we know, this is a relatively rare occurrence in Gombe, so it is not clear if the dogs were hunting in an attempt to kill and eat a young baboon, or if they were just chasing the baboons as packs of dogs may chase deer here in the US. When the dogs saw the chimps approaching, they left the baboons and rushed to meet the approaching chimps. A huge fight ensued, which was undoubtedly dangerous for both the chimps and the dogs. Chimpanzee males are five times our strength and have long sharp canine teeth. Dogs can swarm and attack one individual chimp and could easily injury and kill a small chimpanzee. Six of the eight dogs surrounded and began to attack Edgar. Edgar jumped into a tree, then back to the ground and was able to single out and bite one of the dogs, who began to bleed profusely. He then climbed back into a tree. Londo, a young adult male was displaying nearby in the vegetation when the entire pack of dogs began to chase him. Edgar climbed down and grabbed one of the dogs and threw him into the air. The pack of dogs scattered. As the fight continued in the thick vegetation it is unclear exactly what happened, but the chimps were clearly gaining the upper hand. Over the next few minutes, the dogs began to retreat one by one. The chimpanzees finally won the battle, and when only two dogs remained, they were able to chase the dogs to the boundary of the park. An encounter like this is worrying on many levels and begs more questions than answers. How often does this pack of dogs enter the park? Who owns them and why are they there? Are these hunting dogs whose owners use the dogs to hunt game on the park boundary? This incident illustrates the importance of our research and conservation work in Gombe and of the presence of our field assistants. It is representative of many that occur across the chimpanzee range – where the overlap between humans, domestic animals and wildlife is continuing to grow in new and potentially dangerous ways, and chimpanzees face increasing threats due to illegal poaching. What we do know is that there could be a new problem on our north boundary and, as always, we are focused on mitigating the potential risk to the wildlife within park. 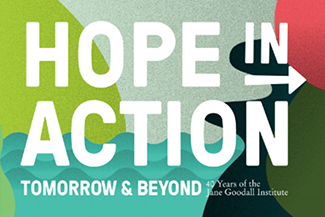 To support our work to continue Dr. Jane Goodall’s research in Gombe – now the longest running wild chimpanzee study in the world – and our work to protect our closest living relatives, consider donating today. Next Article The Forest is Calling – Answering the Call is Our Only Hope.